I have personally represented over 10,000 crime victims in the criminal and civil justice systems during my career. One of my primary goals has been to put together a team of highly skilled lawyers who could help me properly serve the many victims of serious injury and wrongful death who so often call upon me for help. I am pleased to say that I have reached this goal by joining forces with the highly respected law firm of DiFrancesco Bateman in order to establish the first Civil Litigation Practice Group in a major law firm that is dedicated to serve these needs of crime victims. I am immensely proud that I am able to partner my knowledge and experience with the fine litigators within our Civil Litigation Practice Group. Paul Rizzo, Jeffrey Pompeo and I have over 100 years of combined experience as litigators. Sarah Mahony and Nicholas Pompelio are the bright, aggressive and passionate young lawyers of the future. 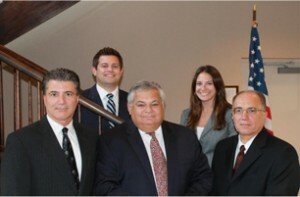 Together we provide services to our clients that are distinct and different from any other law firm. The knowledge, skill and experience of a lawyer are shaped by the needs of the client. The legal needs of crime victims must be addressed with special care. Survivors of homicide and victims of sexual assault, drunk driving and other crimes of violence often suffer immeasurable damages. Too often, the offender has no financial resources and the victim and victim survivors are left to feel that they have no recourse – nowhere to turn for civil justice. Please see who are by reviewing the rest of this website. Google my name to read about my work with crime victims and call or Email me to get a free copy of my book. Call Richard Pompelio Today for a Free Copy of His Book! Crime Victims' Rights: A Guide for Practitioners & Service Providers in the State of New Jersey!